It seems like only yesterday we were assembling dignitaries for a groundbreaking, checking for underground utilities and blanketing the International Boulevard / East 14th Street corridor with door hangers announcing the start of construction. 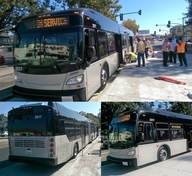 Although time may blur, AC Transit’s much-heralded East Bay Bus Rapid Transit (BRT) project made progress each day of 2018. As a New Year begins, we invite you to take a look back at the remarkable progress made on the BRT in 2018, and hope that you are as excited as we are to begin service in 2019! JANUARY – The Downtown San Leandro Station at Hays and Davis Streets and the Civic Center Station, outside San Leandro City Hall, begin to take shape. 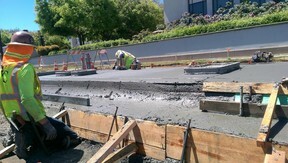 The concrete for the stations and the bus pad — where BRT passengers will board and exit — is meticulously poured by construction crews. FEBRUARY – One month later, eight BRT station platforms — three in San Leandro and five in Oakland — are now in place. 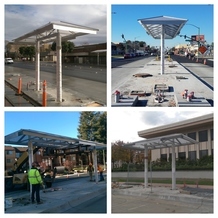 Station canopies, furniture and distinctive artwork will be installed later in the year and into 2019, after the repaving of International Boulevard is complete. 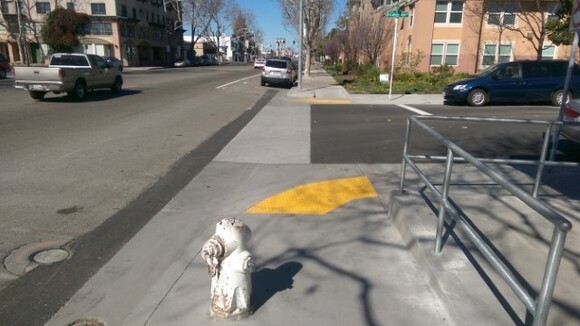 MARCH – By the start of spring, Americans with Disabilities Act (ADA) compliant curb ramps, modernized traffic signals, and upgraded drainage systems are completed in the Hegenberger neighborhood, between 68th and 73rd Avenues. APRIL – Before April showers, the construction of BRT’s median stations in the Hegenberger neighborhood are completed. Six BRT stations are now in place and awaiting final touches. The first of many new and technologically advanced traffic signals is activated on International Boulevard and 81st Avenue. Seniors from Allen Temple Arms Senior Apartments and youth from the East Oakland Youth Development Center can now cross International Boulevard more safely. MAY – As moms prepared for their special day, BRT in San Leandro reaches the milestone of 80 percent construction completion. 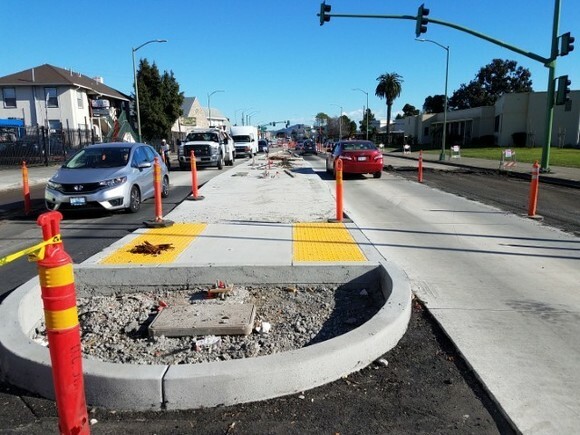 San Leandro residents now enjoy all-new ADA-compliant curb ramps, modernized traffic signals and upgraded drainage systems. 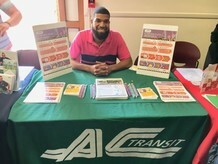 JUNE – As the school year closes, BRT’s Outreach Team collaborates with Allen Temple Baptist Church and local high school students to connect local residents with construction-related careers. 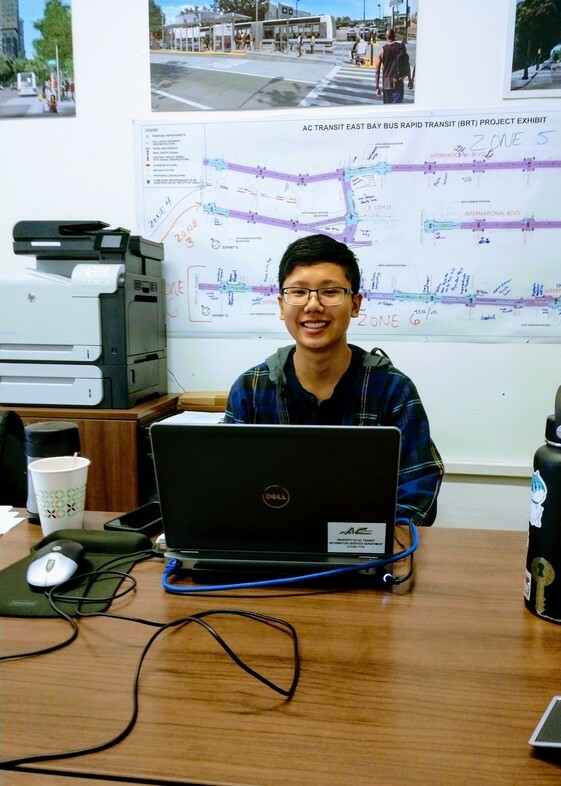 The students conduct outreach at malls, transit stops, and community centers to share job information with hundreds of Oakland residents. Construction in the Elmhurst neighborhood is now 80 percent complete. 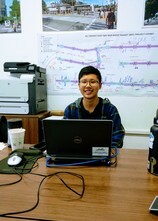 JULY – Before Independence Day fireworks bedazzle the skies, the BRT Outreach Team welcomes an intern from the Metropolitan Transportation Commission (MTC) High School Internship Program to our staff. 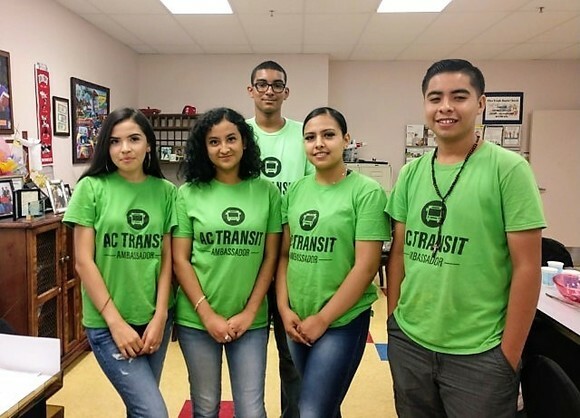 The program provides high school students, with an interest in transportation, the opportunity to work on major transportation projects throughout the region. The addition of the MTC intern amplifies BRT’s outreach efforts over the summer, helping the team better share information about the BRT project with the community. 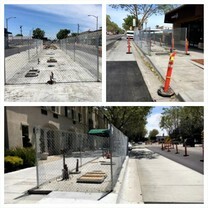 AUGUST – The project gains steam, along with the summer heat, as construction gets underway in the Eastlake, San Antonio and Fruitvale neighborhoods. Construction crews install new traffic signal foundations, ADA-compliant curb ramps, and upgraded drainage systems. SEPTEMBER – The start of fall placed our Outreach Team on the road to the Santa Rita County Jail, where we spoke with over 400 people scheduled for release about careers in construction. 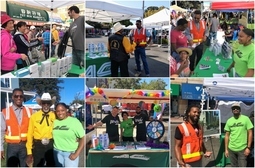 AC Transit is committed to hiring local residents from Oakland and San Leandro to work on the BRT and other construction projects throughout the region. Several of the people we spoke with were card-carrying union members who were ready and eager to return to work. Since BRT’s groundbreaking, we have partnered with the Cypress Mandela Training Center, Rising Sun Energy Center, and the West Oakland Jobs Resource Center to connect residents with good-paying construction jobs. Outreach team member Christopher Higgenbotham at a job fair, excited to share information about construction career opportunities with the BRT project. 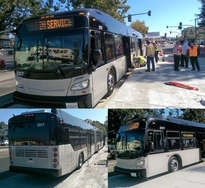 OCTOBER – As thoughts of candy corn and costumes neared, AC Transit began testing the new BRT buses at station platforms along International Boulevard / East 14th Street! For many, this was their first glimpse of the train-inspired doors and how BRT’s level flooring will make boarding and exiting easier for riders with mobility devices. NOVEMBER – The repaving of International Boulevard begins! The plan is to repave nearly all of International Boulevard between 42nd and Durant Avenues before the end of 2018. By the time BRT service begins in December 2019, nearly 10 miles of the BRT corridor will be repaved curb-to-curb with new asphalt that will last as long as 20 years. Fall also marks the end of festival season for the BRT Outreach Team. Between May and November, the Team participated in numerous festivals, including the Oakland Pride Parade & Festival, the San Leandro Cherry Festival, and the Chinatown Street Fest. This year, the Outreach Team participated in nearly 100 festivals, community and civic meetings, job fairs, and neighborhood events. Since the project began, the team has participated in almost 250 events, sharing BRT information with thousands of people. 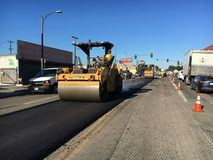 DECEMBER – As candy canes and visions of sugar plums dance in our heads, the BRT project celebrates yet another major milestone with the completion of paving on International Boulevard between 42nd and Durant Avenues. Additionally, 16 station canopies have been installed, including all canopies in San Leandro. Major construction is mostly complete in San Leandro and East Oakland, and a total of 19 stations are now in place. Overall, the BRT is 51 percent complete and the project continues to gain momentum in the Eastlake, San Antonio, and Fruitvale neighborhoods, as well as downtown Oakland. In 2019, residents will continue to see the BRT stations take shape, including the installation of passenger seating, security cameras, lighting, real-time arrival information, artistic enhancements, beautiful landscaping and more. 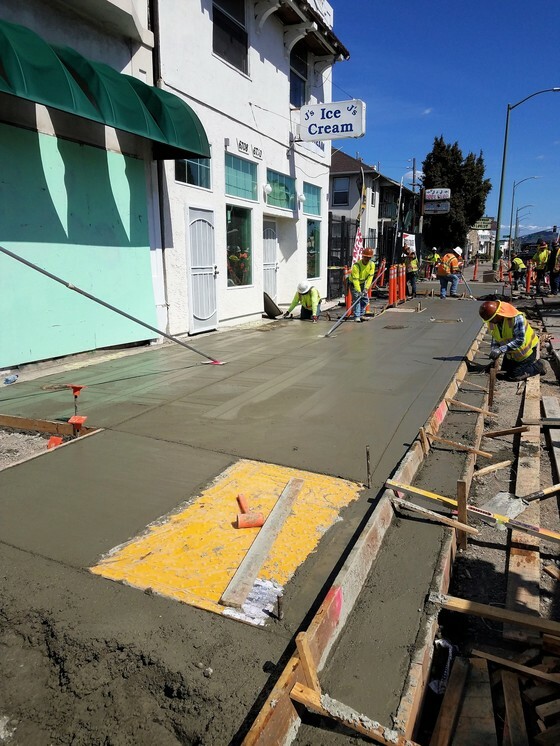 International Boulevard from 42nd Avenue north to downtown Oakland will be repaved, along with the installation of new traffic signals, safer pedestrian crossings, and dozens more ADA-compliant curb ramps. The 9.5-mile BRT system is not only on budget but on schedule to begin service to riders in December 2019! Yet the community is already enjoying many of its benefits including new pavement and sidewalks, ADA-compliant curb ramps, safer street crossings and more! An even greater number of people will begin enjoying safer, more pedestrian-friendly streets as the project nears completion. AC Transit and our BRT staff wishes to thank residents, businesses, and our community partners for your continued support and patience as we work to deliver the first-ever BRT to Oakland and San Leandro later this year! Parece que fue ayer cuando estábamos reuniendo dignatarios para el comienzo de las obras, verificando los servicios públicos bajo tierra y repartiendo letreros colgantes en las puertas por todo el corredor de International Boulevard y East 14th Street anunciando el comienzo de la construcción. Aunque ya pasó un tiempo y la memoria se difumina, el muy anunciado proyecto de Autobús de Tránsito Rápido de la Bahía del Este de AC Transit hizo muchos progresos cada día del año 2018. Ahora que empieza el nuevo año, le invitamos a que eche una mirada hacia atrás para ver el remarcable progreso que se ha hecho en el BRT durante el año 2018, ¡y esperamos que usted esté tan emocionado como lo estamos nosotros con el comienzo del servicio en el 2019! ENERO – La estación de Downtown San Leandro en las calles Hays y Davis y la estación Civic Center afuera de San Leandro City Hall empiezan a tomar forma. El cemento para la plataforma de las estaciones y los autobuses (donde los pasajeros del BRT se subirán y bajarán de abordo) es vertido meticulosamente por los trabajadores de construcción. FEBRERO – Un mes más tarde, ya se instalaron ocho plataformas de estaciones BRT (tres en San Leandro y cinco en Oakland). Las marquesinas, el mobiliario y el arte distintivo se instalarán a finales de año y a principios de 2019, cuando el nuevo pavimento de International Boulevard este completado. MARZO – Al comienzo de la primavera, se completaron las rampas en los bordillos certificadas por la ley ADA (Americanos con Discapacidades), señales de tráfico modernizadas y sistemas de drenaje mejorados en el vecindario de Hegenberger, entre las avenidas 68th y 73rd . ABRIL – Antes de las lluvias de abril, se completó la construcción de las estaciones BRT en las medianas del vecindario de Hegenberger. Ahora hay seis estaciones BRT completadas y aguardando los últimos retoques. La primera de muchas señales de tráfico tecnológicamente avanzadas se activó en International Boulevard y 81st Avenue. Las personas mayores de los apartamentos Allen Temple Arms Senior Apartments y los jóvenes del centro East Oakland Youth Development Center pueden ahora cruzar la calle en International Boulevard con más seguridad. MAYO – A medida que las madres se preparan para su día especial, el BRT en San Leandro llegó a la meta del 80 por ciento de construcción completada. Los residentes de San Leandro pueden ahora disfrutar de las nuevas rampas en los bordillos que cumplen con la ley ADA, las señales de tráfico modernizadas y los sistemas de drenaje mejorados. JUNIO – A medida que se acerca el final del año escolar, el equipo de divulgación del BRT colabora con Allen Temple Baptist Church y los estudiantes de secundaria locales para conectar a residentes locales con carreras profesionales relacionadas con la construcción. Los estudiantes celebraron actos de divulgación en centros comerciales, paradas de transito y centros comunitarios para compartir información laboral con cientos de residentes de Oakland. La construcción en el vecindario de Elmhurst está completada en un 80 por ciento. JULIO – Antes de que los fuegos artificiales del Día de la Independencia iluminen los cielos, el equipo de divulgación del BRT da la bienvenida a nuestro personal a un interno de la Comisión Metropolitana de Transporte (MTC) a través del programa de internado de educación secundaria. El programa proporciona a estudiantes de secundaria que tienen un interés por el transporte la oportunidad de trabajar en proyectos importantes de transporte en toda la región. La adición del interno de MTC amplifica los esfuerzos de divulgación del BRT para el verano, ayudando al equipo a compartir la información acerca del proyecto BRT con la comunidad de la mejor manera. AGOSTO – El proyecto gana fuerza, junto con el calor del verano, a medida que la construcción progresa en los vecindarios de Eastlake, San Antonio y Fruitvale. Los equipos de construcción instalan cimientos para las nuevas señales de tráfico, las rampas de bordillos que cumplen con la ley ADA y los sistemas de drenaje mejorados. SEPTIEMBRE – A comienzos de la temporada de otoño, nuestro equipo de divulgación se desplazó a la prisión del condado de Santa Rita para hablar con más de 400 personas a punto de ser liberadas acerca de carreras profesionales en la construcción. AC Transit está comprometido a contratar residentes locales de Oakland y San Leandro para trabajar en el BRT y otros proyectos de construcción en toda la región. Muchas de estas personas con las que hablamos ya tenían tarjeta de membresía con sindicatos y estaban preparadas para volver al trabajo. Desde el comienzo de las obras del BRT, nos hemos asociado con Cypress Mandela Training Center, Rising Sun Energy Center y West Oakland Jobs Resource Center para conectar a los residentes con trabajos de construcción bien pagados. 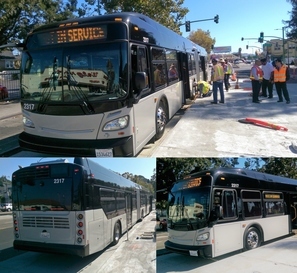 OCTUBRE – Con los pensamientos puestos en los disfraces y las golosinas, ¡AC Transit empezó a probar los nuevos autobuses BRT en las plataformas de estación a lo largo de la calles International Boulevard / East 14th! Para muchos, este fue el primer contacto con las puertas inspiradas en los trenes y a nivel del suelo, lo que hace que subirse y bajarse del autobús sea mucho más fácil para los pasajeros con dispositivos de movilidad. NOVIEMBRE – ¡Empieza la repavimentación de International Boulevard! El plan consiste en repavimentar casi todo International Boulevard entre las avenidas 42nd y Durant antes del final de 2018. Cuando empiece el servicio BRT en diciembre de 2019, cerca de 10 millas del corredor BRT estarán repavimentadas de bordillo a bordillo con asfalto nuevo que durará tanto como 20 años. El otoño también marca el final de la temporada de festivales para el equipo de divulgación del BRT. Entre mayo y noviembre, el equipo participó en numerosos festivales, incluyendo Oakland Pride Parade & Festival, San Leandro Cherry Festival y Chinatown Street Fest. Este año, el equipo de divulgación participó en casi 100 festivales, reuniones comunitarias y cívicas, ferias laborales y eventos locales. Desde que empezó el proyecto, el equipo ha participado en casi 250 eventos, compartiendo información BRT con miles de personas. DICIEMBRE – Con visiones de golosinas y confites en nuestras cabezas, el proyecto BRT celebra otra meta importante con el final de los trabajos de pavimentación en International Boulevard entre las avenidas 42nd y Durant. Además, se han instalado 16 marquesinas en las estaciones, incluyendo todas las marquesinas en San Leandro. 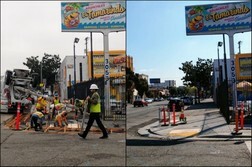 La construcción esta casi completada en San Leandro y East Oakland, con un total de 19 estaciones completadas. En conjunto, el BRT está completado en un 51 por ciento y el proyecto continua avanzando en los vecindarios de Eastlake, San Antonio y Fruitvale, así como en Downtown Oakland. En el 2019, los residentes continuarán viendo como las estaciones BRT toman forma, incluyendo la instalación de los asientos para pasajeros, cámaras de seguridad, iluminación, información de llegadas en tiempo real, embellecimientos artísticos, bonitos jardines y mucho más. Se repavimentará International Boulevard desde 42nd Avenue norte hasta downtown Oakland, y también se instalarán nuevas señales de tráfico, cruces para peatones más seguros y docenas de rampas para bordillos que cumplen con la ley ADA. ¡El sistema BRT de 9.5 millas no solo esta cumpliendo con el presupuesto, sino que también esta programado para empezar a dar servicio a los pasajeros en diciembre de 2019! La comunidad ya está disfrutando de muchos de los beneficios del BRT, incluyendo el nuevo pavimento y aceras, las rampas que cumplen con ADA, cruces para peatones más seguros, ¡y mucho más! Mucha más gente comenzará a disfrutar de las calles más seguras para los peatones a medida que el proyecto se acerca a su fin. ¡AC Transit y nuestro personal del BRT agradece a los residentes, negocios y socios comunitarios por su apoyo continuado y su paciencia a medida que trabajamos para traer el primer BRT a Oakland y San Leandro a finales de este año! 十月 – 随着万圣节临近，AC Transit 开始在 International Boulevard / East 14th Street 的站台测试新型 BRT 公交车！对许多人来说，他们第一次看到这种火车式车门以及 BRT 水平地板如何使乘坐移动设备的乘客更方便地上下车。. Dường như chỉ mới hôm qua, chúng tôi đã tập hợp các chức sắc để khởi công, kiểm tra các tiện ích ngầm và phủ kín hành lang International Boulevard / East 14th Street với các móc treo cửa để thông báo về việc bắt đầu xây dựng. Mặc dù thời gian có thể lu mờ, dự án đã được báo trước rất sớm về Hệ Thống Chuyên Chở Xe Buýt Tốc Hành Đông Vịnh (BRT) của AC Transit đã được tiến hành mỗi ngày trong năm 2018. Khi Năm Mới bắt đầu, chúng tôi mời quý vị nhìn lại tiến triển đáng lưu ý đã được thực hiện cho BRT trong năm 2018, và hy vọng rằng quý vị cũng phấn khởi như chúng tôi để bắt đầu phục vụ trong năm 2019! THÁNG GIÊNG – Trạm Trung Tâm Thành Phố San Leandro tại Hays Street và Davis Street và Trạm Civic Center, bên ngoài Tòa Thị Chánh Leandro, bắt đầu thành hình. Bê tông cho các trạm và chỗ xe buýt đậu - nơi hành khách BRT sẽ lên và xuống - được các đội xây dựng đổ một cách tỉ mỉ. THÁNG HAI – Một tháng sau, tám sân ga trạm BRT — ba ở San Leandro và năm ở Oakland — hiện đã xong. Các mái che trạm, băng ghế và tác phẩm nghệ thuật đặc sắc sẽ được lắp đặt vào cuối năm và sang năm 2019, sau khi việc tráng lại mặt đường của International Boulevard được hoàn tất. THÁNG BA – Vào đầu mùa xuân, các con dốc ở lề đường theo đúng Đạo Luật Người Mỹ Khuyết Tật (ADA), đèn hiệu giao thông được hiện đại hóa, và hệ thống thoát nước được nâng cấp đều được hoàn thành trong khu phố Hegenberger, ở giữa 68th Avenue và 73rd Avenue. THÁNG TƯ – Trước trận mưa rào Tháng Tư, việc xây dựng các trạm ở giữa đường của BRT trong khu phố Hegenberger đã hoàn tất. Sáu trạm BRT hiện đang sẵn sàng và chờ đợi những hoàn thiện cuối cùng. Đèn hiệu giao thông đầu tiên trong số nhiều đèn hiệu giao thông mới với công nghệ tiên tiến được khởi động trên International Boulevard và 81st Avenue. Người cao niên từ Chung Cư Cao Niên Allen Temple Arms và thanh thiếu niên từ Trung Tâm Phát Triển Thanh Thiếu Niên Đông Oakland giờ đây có thể băng qua International Boulevard một cách an toàn hơn. THÁNG NĂM – Khi các bà mẹ chuẩn bị cho ngày đặc biệt của mình, BRT ở San Leandro đạt mốc 80% hoàn tất xây dựng. Hiện tại cư dân San Leandro được hưởng các con dốc ở lề đường hoàn toàn mới theo đúng ADA, đèn hiệu giao thông được hiện đại hóa và hệ thống thoát nước được nâng cấp. THÁNG SÁU – Khi năm học chấm dứt, Nhóm Tiếp Xúc Cộng Đồng của BRT phối hợp với Nhà Thờ Baptist Allen Temple và các học sinh trung học địa phương để kết nối cư dân địa phương với các ngành nghề liên quan đến xây dựng. Các học sinh tiến hành việc tiếp xúc cộng đồng tại các trung tâm mua sắm, trạm xe công cộng, và trung tâm cộng đồng để chia sẻ thông tin về việc làm với hàng trăm cư dân của Oakland. Công trình xây dựng trong khu phố Elmhurst hiện đã hoàn tất được 80%. THÁNG TÁM – Dự án được đẩy mạnh, cùng với sức nóng mùa hè, trong khi việc xây dựng đang được tiến hành ở các khu phố Eastlake, San Antonio và Fruitvale. Đội xây dựng lắp đặt nền cho các đèn hiệu giao thông mới, con dốc ở lề đường theo đúng ADA, và hệ thống thoát nước được nâng cấp. THÁNG CHÍN – Đầu mùa thu Nhóm Tiếp Xúc Cộng Đồng của chúng tôi đến Nhà Tù Quận Santa Rita, nơi chúng tôi đã nói chuyện với hơn 400 người đã được xếp đặt để tiếp nhận thông báo về nghề nghiệp trong ngành xây dựng. AC Transit cam kết thuê các cư dân địa phương từ Oakland và San Leandro để làm việc cho BRT và các dự án xây dựng khác trong khắp vùng. Một số người chúng tôi đã nói chuyện là các thành viên mang thẻ công đoàn đã sẵn sàng và nôn nóng được trở lại làm việc. Kể từ khi BRT khởi công, chúng tôi đã hợp tác với Trung Tâm Huấn Luyện Cypress Mandela, Trung Tâm Năng Lượng Mặt Trời Mọc, và Trung Tâm Tài Nguyên Việc Làm West Oakland để kết nối cư dân với các công việc xây dựng được trả lương cao.t. THÁNG MƯỜI – Khi những suy nghĩ về kẹo ngô và trang phục đã gần kề, AC Transit bắt đầu thử nghiệm các xe buýt BRT mới tại các sân trạm dọc theo International Boulevard / East 14th Street! Đối với nhiều người, đây là lần đầu tiên họ nhìn thấy những cánh cửa lấy cảm hứng từ tàu hỏa và cách sàn bằng của BRT sẽ giúp cho hành khách với các thiết bị di động lên và xuống dễ dàng hơn. THÁNG MƯỜI MỘT – Việc tráng lại mặt đường International Boulevard bắt đầu! Kế hoạch là tráng lại gần như tất cả International Boulevard ở giữa 42nd Avenue và Durant Avenue trước khi năm 2018 kết thúc. Vào lúc dịch vụ BRT bắt đầu trong Tháng Mười Hai 2019, gần 10 dặm hành lang BRT sẽ được tráng lại từ lề đường bên này sang lề đường bên kia với một lớp nhựa mới sẽ lâu bền trong 20 năm. Mùa Thu cũng đánh dấu sự kết thúc của mùa lễ hội cho Nhóm Tiếp Xúc Cộng Đồng của BRT. Trong khoảng thời gian từ Tháng Năm đến Tháng Mười Một, Nhóm đã tham gia vào rất nhiều lễ hội, bao gồm Lễ Hội & Diễn Hành Pride của Oakland, Lễ Hội Hoa Anh Đào San Leandro và Lễ Hội Ngoài Đường tại Phố Tàu. Năm nay, Nhóm Tiếp Xúc Cộng Đồng đã tham gia gần 100 lễ hội, các cuộc họp cộng đồng và dân sự, các hội chợ việc làm, và các sự kiện trong khu phố. Từ khi dự án bắt đầu, nhóm đã tham gia gần 250 sự kiện, chia sẻ thông tin BRT với hàng ngàn người. THÁNG MƯỜI HAI – Khi những cây kẹo hình gậy chống và hình ảnh của điệu múa sugar plum hiện lên trong đầu chúng ta, dự án BRT kỷ niệm một cột mốc quan trọng khác với sự hoàn thành việc lát mặt đường International Boulevard ở giữa 42nd Avenue và Durant Avenue. Ngoài ra, mái che của 16 trạm đã được lắp đặt, bao gồm tất cả các mái che tại San Leandro. Việc xây dựng chính yếu hầu như đã hoàn thành tại San Leandro và Đông Oakland, và hiện có tổng cộng 19 trạm đã làm xong. Nói chung, BRT đã hoàn thành 51 phần trăm và dự án tiếp tục đạt được đà tiến triển tại các khu phố Eastlake, San Antonio, và Fruitvale, cũng như trung tâm thành phố Oakland. Năm 2019, cư dân sẽ tiếp tục chứng kiến các trạm BRT hình thành, bao gồm việc lắp đặt ghế hành khách, máy chụp hình an ninh, ánh sáng, thông tin về các chuyến xe đến theo thời gian thực, tăng cường nghệ thuật, cảnh quan đẹp và nhiều hơn nữa. International Boulevard từ 42nd Avenue từ phía bắc đến trung tâm thành phố Oakland sẽ được tráng lại, cùng với việc lắp đặt các đèn hiệu giao thông mới, lối đi băng qua đường dành cho người đi bộ an toàn hơn, và hàng chục con dốc ở lề đường theo đúng ADA. Hệ thống BRT dài 9.5 dặm không chỉ theo đúng ngân sách mà còn theo đúng lịch trình để bắt đầu dịch vụ cho hành khách vào Tháng Mười Hai 2019! Tuy nhiên, cộng đồng đã được hưởng nhiều lợi ích của hệ thống bao gồm các lề đường và vỉa hè mới, các con dốc ở lề đường theo đúng ADA, các lối đi băng qua đường an toàn hơn và nhiều hơn nữa! Một số lượng lớn hơn nữa sẽ bắt đầu hưởng được những đường phố an toàn hơn, thân thiện với người đi bộ hơn trong khi dự án sắp hoàn thành. AC Transit và ban nhân viên BRT của chúng tôi muốn cảm ơn cư dân, các doanh nghiệp, và các đối tác trong cộng đồng của chúng tôi vì đã tiếp tục hỗ trợ và kiên nhẫn trong khi chúng tôi làm việc để cung cấp BRT đầu tiên từ trước đến giờ cho Oakland và San Leandro vào cuối năm nay!